Warning. This guide pretends you got at least to Step 3 in the Quick Start Guide. If you didn't, please check it out, or at least figure out how to enable the bot. This guide will explain how to get osu! song requests working on your channel. Step 1 Enable the osu! plugin. First thing you'll have to do is enabling the osu! plugin here. Step 2 Authenticate your osu! account. Go to osu! plugin settings here. Find the username field and click the link below it. Now, open osu! and write "!verify" to Mikuia. 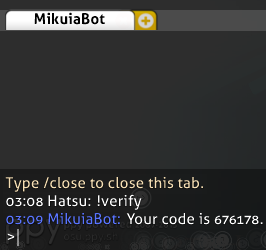 Easiest way to do that is by using "/msg Mikuia" to open a conversation, and then using !verify. Put the code on the website you opened earlier, and click Save. You should be redirected back to the settings page, and your username field should be filled out. Step 3 Configure the plugin. Global requests are enabled by default, so if you don't want to change anything more, you should be good to go. 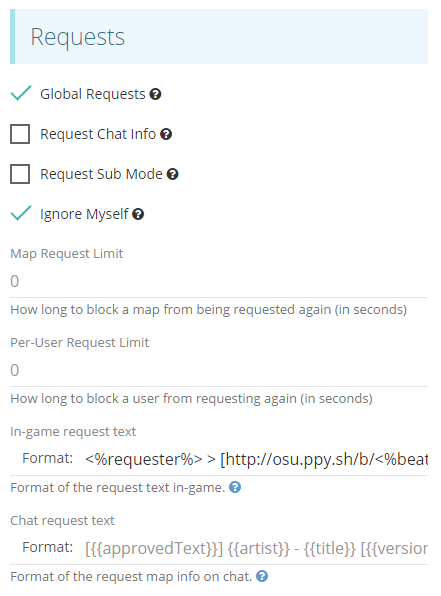 You can also enable or disable the request information on chat, limit requests to subs, set request limits, and more. Before you start testing, remember to disable the "Ignore Myself" option, or use a different Twitch account.